Summary (from Goodreads): Mara Dyer once believed she could run from her past. She can’t. She used to think her problems were all in her head. They aren’t. She couldn’t imagine that after everything she’s been through, the boy she loves would still be keeping secrets. She’s wrong. 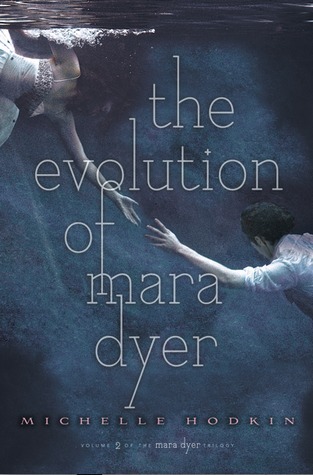 In this gripping sequel to The Unbecoming of Mara Dyer, the truth evolves and choices prove deadly. What will become of Mara Dyer next? My Summary: After everything she'd been through, Mara thought she could finally be happy... but she was wrong. The dead don't always stay dead, and as Mara soon learns, the dead sometimes want revenge. Haunted by visions of a boy only she can see - a boy who was supposed to have died in the building collapse that killed his sister Claire and Mara's friend Rachel - Mara isn't sure what's real and what isn't anymore. After one too many freak-outs, her parents decide it'd be best to have Mara committed... for her own good. But it's not Mara hurting herself, it's Jude... or is it? My Thoughts: Oh man. I'd been waiting ages for book two of the Mara Dyer (not her real name) to come out for ages! I picked it up yesterday morning and drove straight home to drive right in. Six hours later I was finished, and my mind was blown. Seriously, this is probably one of my favourite books of this year so far. I relished every page, being careful not to read too fast in case I missed an important detail. I adore books like this - books that mess with you and keep you on edge until long after you've flipped the last page. Mara's story continues in an epic and creepy fashion, making you question everything. I really loved the addition of the notes and dream-like sequences, and the fact that I had no idea what was going to happen next. I also got a few great laughs out of it - this book pokes fun at certain YA cliches while somehow managing to remain serious and enthralling. Everything was perfect - and I refuse to believe what happened in the ending was real. Absolutely refuse. Final Thoughts: I recommend this novel to anyone who enjoys psychological thrillers and paranormal YA with a little bit of romance and a whole lot of edge. Lovers of Kelley Armstrong's Darkest Powers and Darkness Rising series will love it! I loved The Unbecoming of Mara Dyer but have not had a chance to read this second installment. I have read several quotes and really have to pick this one up. Thanks for your great review. I have to carve out the time to read this. The Unbecoming of Mara Dyer was awesome. I finished it in one day, which is quite unusual for me. Thanks for your review.